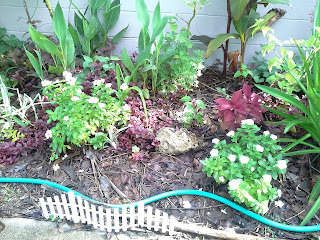 It's been awhile since I've updated you on the garden, but I don't do a lot in the summer. I was crazy busy in June, so didn't even get a June Month-to-Month post up. I tore out two of the brugmansias (angel trumpets) because who really needs 3 of the same kind of plant? Thought about giving them away, but it's really not a good time to transplant, so didn't do that. 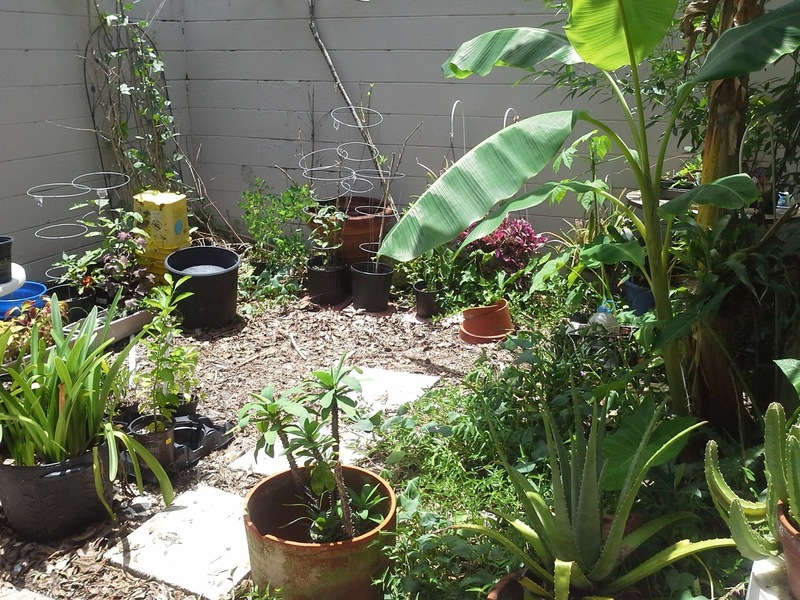 In their place, I put a triple yellow datura, a double purple datura, a Hibiscus sabdariffa (sorrel or Florida cranberry) and a talinum fruticosum. Also added a few marigolds, but the snails made short work of them, so I added some white vincas and more butterfly weed. That bed has quite a bit of butterfly weed in it already, so it should be happy there. I just stuck sticks of it into the ground, but they all rooted, so it should be beautiful when they all bloom in the fall. The courtyard plants are doing well. 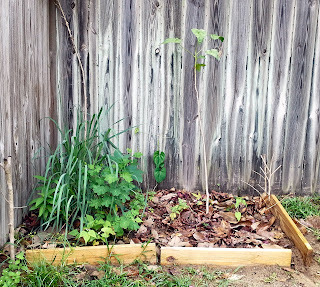 Of course, the Cherokee Purple tomato died, and I replaced it with some regrown bunching onions and a Texas Star hibiscus baby -- the only one that came up from seed I planted way back in May. There was so much rain that the SuperSweet 100 tomato in the 5-gallon bucket also died, but I had another out in another spot that wasn't doing well, so I transplanted it and it's starting to grow now. I also squeezed some seeds of one ripe fruit into the pot, which also grew. The yard-long beans are climbing their trellis and now putting out a few beans every few days. 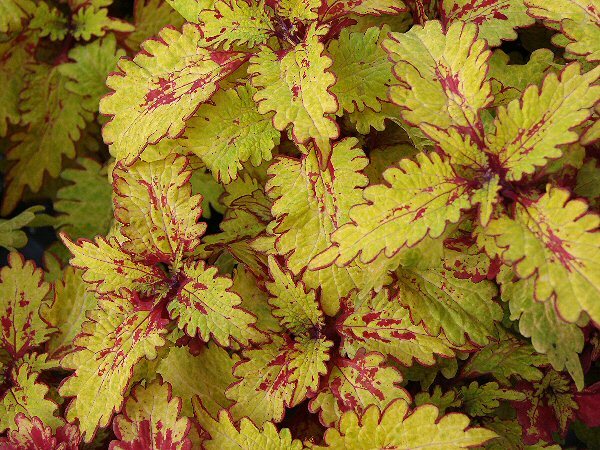 I like them, and will definitely be planting more of these in the fall. I've already saved some seeds from "hidden" pods that I found dried out. They are growing in a pot now, and I'm sure they've grown into the ground, but that's not a very good location in the corner with all the rocks, so maybe I'll try a larger pot this fall and plant more of them. 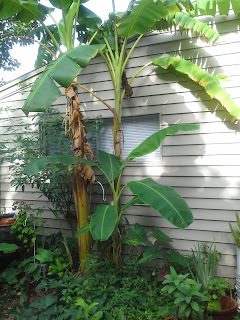 The Ice Cream bananas are doing exceptionally well, and have put out three pups, two of which are growing like mad and one new one that is just taking off. I'm hoping for a crop on two of the adults this year, but we'll see. Bell peppers have been iffy. The NOID red pepper put out two fruits, then lost all its leaves, but it's coming back out now. The smaller Belle Grande survivor is struggling. I put it into a new pot with different soil, and buried it a bit deeper to try to get it to make more roots, since it is wilting badly every day. It has bloomed, but no fruits yet. On a good note, the Cubanelle has taken off, is growing like mad and has several fruits on it. The Ichiban eggplant is doing o.k., but has also suffered with the excessive rain. I got one fruit off of it, and it took its time putting out another, which is growing well. I think I may have another coming. Not much flowering. The angel trumpet put out one last shower of blooms, but I suppose I'll have to wait until fall for more. 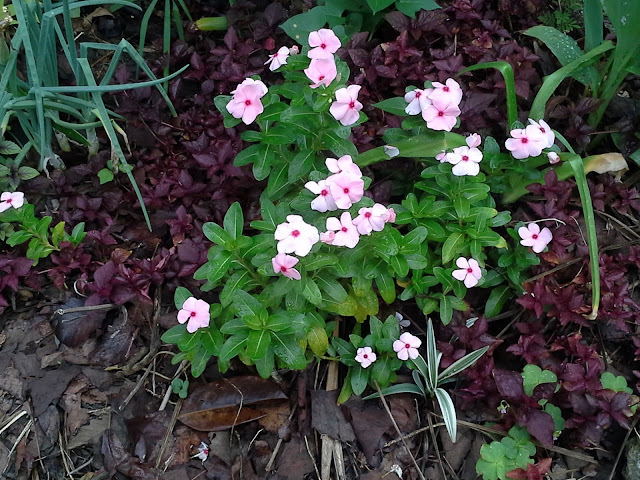 Vincas in the South-facing bed are about the only things doing well. Marigolds I planted in June are just now starting to put out a few blooms. They'll be gorgeous in the fall, so I'm being patient. The daturas I planted in the South garden are growing slowly, so I've started fertilizing them with Miracle Gro once a week to try to push them to grow faster. I know there are earthworms in that garden, but I think it's so hot, they stay very deep and the plants don't get the nutrients, so I may have to start fertilizing the whole bed. 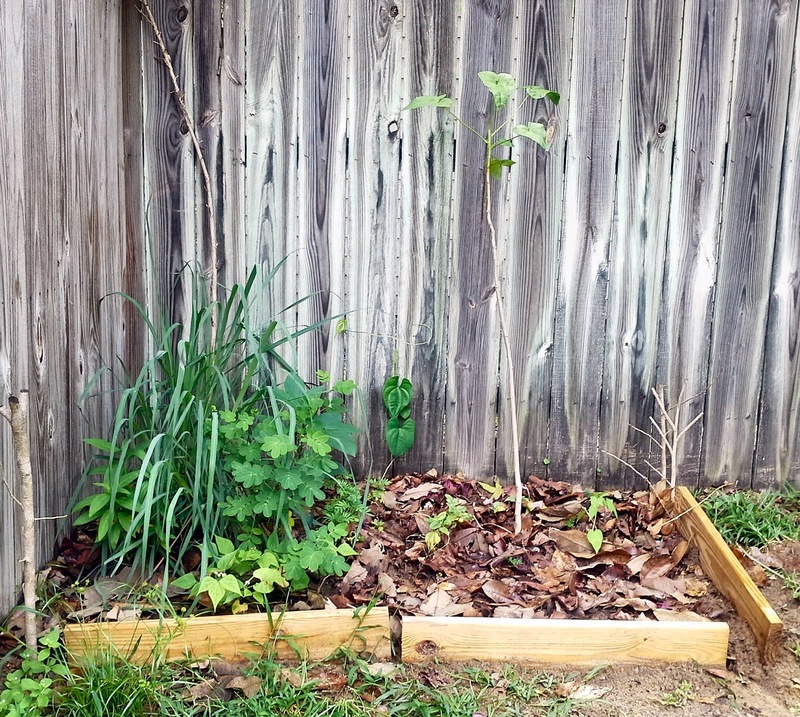 The new beds are doing well, and everything is growing. The lemon grass, of course, is taking over everything, so I'll have to harvest some for tea soon. 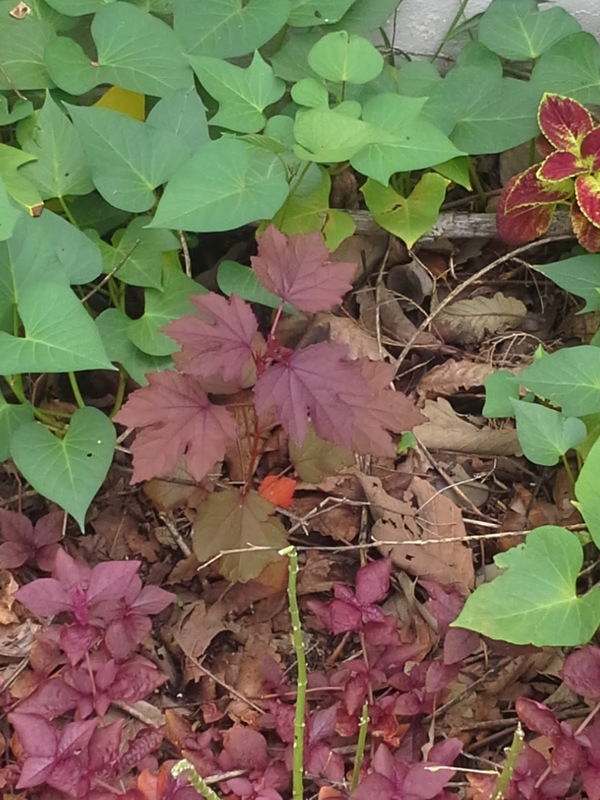 The hibiscus in the right bed are growing like mad since this picture was taken. There is a H. sabdariffa on the left and a Texas Star on the right. Marigolds are starting to bloom a bit, and the Dioscorea alata is winding up and through the fence. Of course, it will die down in the winter, and I'll see if there is a root worth harvesting. The seedlings are doing o.k. I need to put the double butterfly pea seedlings in a pot so they can grow more. Of course, none of the other seeds I planted in the 6-packs even sprouted, but I'm leaving them there hoping against all hope something will eventually come up. I took cuttings of the Cranberry Hibiscus that came up in one of the smaller pots and grew well, and they are rooting in water in the front window. I only got two plants out of 10 I planted, so I'm trying to at least multiply them. This one is doing o.k. 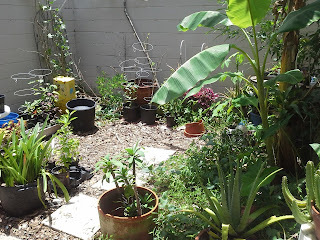 in the South garden and another rooted cutting is in the brugmansia bed planted by the triple yellow datura. It seems to be doing o.k., so I should have at least three plants. Lots more has been happening, but I'll stop here. All in all, the gardens are doing well despite all the rain and heat. I'm harvesting some greens and beans and am generally happy with everything for now. Hope all your gardens are doing well too! Tell me about them in the comments, if you like.